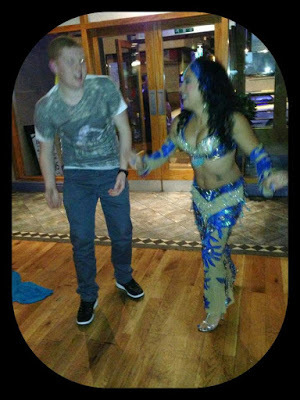 A dancing Bellygram is basically a suprise belly dance performance where the guest of honour is made the centre of attention. Similar to aasinging telegram only in the form of a belly dancer who doesn't sing. It is a short and sweet mini show that focuses more on entertainment value. It is designed for fun and spectacle. This type of booking works well if you are having a smaller party or a short party at home or at work in an office space where one of your work mates is leaving. It also works well at a Christmas party or for someone's suprise birthday party. For a dancing Bellygram the belly dance may present the birthday cake or gift. This type of booking is ussually held in the day time, It is value for money and great opportunity to take some fun and memorable photographs. Are you organising an office party, Birthday party or christmas party and looking for something different to entertain your guest of honour or guests? Are you close to Liverpool Wirral & Chester or North Wales? Why not hire a dancing Bellygram? 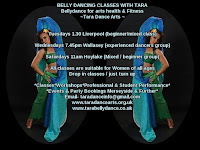 Tara is a Professional belly dance artist & entertainer available for mini shows (dancing Bellygram) in your area. 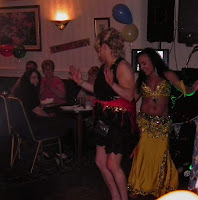 Fun entertaining belly dance performance & participation for suprise birthdays office parties and house parties. Tara turns up in costume with her mobile speaker all ready to entertain you and your guests.